This is meant as the second instalment in a trio of reviews of albums released by one of the most forward-thinking independent labels on the current music scene – New York-based MoonJune Records. As a follow-up to View from Chicheng Precipice, here is another album that many listeners may very well see as nearly unapproachable, but whose authentically progressive nature can hardly be denied. 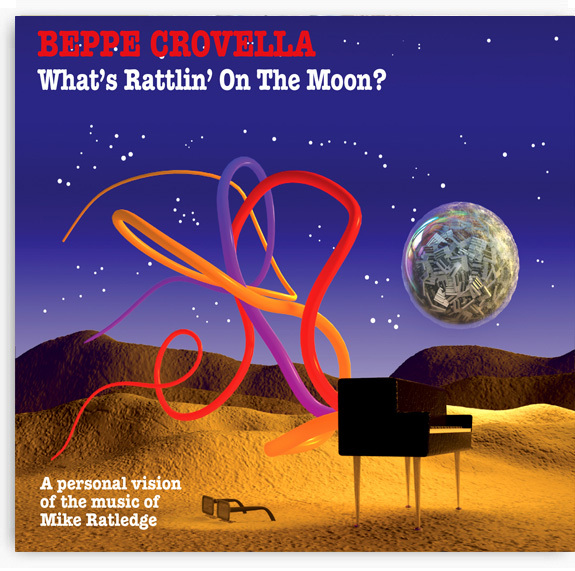 The subtitle to Beppe Crovella’s What’s Rattlin’ on the Moon? reads “A Personal Vision of the Music of Mike Ratledge” – which alone should put paid to any allegations that this is yet another run-of-the-mill tribute album. An extraordinary musician in his own right, with an impressive career both as a solo artist and the mind behind Italian jazz-rock outfit Arti e Mestieri, Crovella is clearly not interested in faithfully reproducing music that is available elsewhere – but rather in offering his own reinterpretation of some of the legendary Soft Machine keyboardist’s ground-breaking compositions. The result of this daring, enlightened operation (conceived by Crovella and MoonJune Records mainman Leonardo Pavkovic) is a disc that, while anything but easy to approach, and obviously possessing very limited mass appeal, is a fascinating listen, especially for anyone with a keen interest in vintage keyboards. Since the music of Soft Machine is undeniably an acquired taste in itself, commanding an almost fanatical adoration on the part of its fans, and an equally strong rejection on the part of ‘unbelievers’, an album offering an apparently one-dimensional take on said music is very likely to send a lot of people running for the exits. First of all, it requires quite a bit of patience on the part of the listener, even from those who should be used to the less than easily digestible nature of most progressive rock. Moreover, the distinct lack of the ‘rock’ part of the genre definition can prove a turn off – and the sheer length of the project (close to 80 minutes) is not likely to help sceptics warm to it. However, those who will stick with the album and give it the attention it deserves will reap their rewards, because What’s Rattlin’ on the Moon? offers many moments of real interest, and some of sheer delight. A master of his craft, Crovella recreates the sound of an entire band with his array of vintage keyboards – ruling out the use of those synthesizers and their ilk that have become so indispensable in modern music-making. It is often astonishing to hear those keyboards fulfil the role of the bass or drums, though in most cases they just weave layers of sound in the Softs’ typically free-form style. As the album is divided into three recognizable parts, the pauses between the individual numbers are almost non-existent – as if each part was meant to be listened to as a single track. This makes for a very distinctive listening experience, the polar opposite of a conventional song-based approach – though equally far removed from the somewhat sterile displays of technical dexterity that are often an integral part of ‘prog’ recordings. The ten Soft Machine compositions are reinterpreted in such a way as to be nearly unrecognizable. This is especially the case of the two tracks from the band’s iconic Third album, “Out-Bloody-Rageous” and “Slightly All the Time”, the latter being possibly the highlight of the disc with its hypnotic yet melodic line and fascinating use of the Mellotron to provide choral effects. All the compositions share the same rarefied, riveting texture, which is intended to be savoured slowly, possibly not in one take. At every successive listen, different effects will unfold – pulsating, surging, solemn, sometimes flowing, sometimes choppy, creating subtly shifting layers of sound. It is the kind of music that will fade in the background if left unattended, so to speak – meant to be listened to, not just heard. The two mini-suites at the end of the album are original Crovella compositions intended, in some ways, to ‘describe’ the creative process behind the album. Both are largely piano-based and less idiosyncratic than the first part of the disc, with a stronger melodic development and some jazzy touches. “Moon Geezers”, dedicated to the sadly deceased former Soft Machine members Elton Dean and Hugh Hopper, closes the album on a suitably measured, melancholy note. As already intimated, What’s Rattlin’ on the Moon? is not an album that will appeal to everyone, especially not those with short attention spans. It does, however, stand head and shoulders above the many hackneyed tribute albums that flood the progressive rock market. Experimental and very personal (even if a tad overlong), this is a must-listen for Soft Machine fans, and highly recommended to lovers of genuinely personal takes on prog classics.